What the heck is habitat? I have seen a wide gamut of responses to the question posed in the title of this post. While preparing for my Ph.D. candidacy exams, I was asked a version of this question as it related to ducks and agonized over the response for months (you’ll see elements of my answer below). In another extreme, I recently posed the same question at a meeting and received an enthusiastic, unequivocating answer of, “corn fields.” I’ll spare you the details of why it is that Iowa’s 13.2 million acres of corn are almost certainly not a limiting feature for ducks, but suffice it to say that my mental picture of habitat for ducks (wetlands) was starkly different from this respondent’s own mental image (corn fields). Same word. Same question. Drastically different responses. The first factor, is what kind of habitat we’re talking about. Habitat the noun is functionally meaningless without the clarifying help of one or more adjectives like “pileated woodpecker habitat”, “duck nesting habitat” or “winter pheasant habitat”. Asserting, “I’m creating habitat” could simultaneously mean you’re building a flat-roofed building where Common Nighthawks will nest or you’re restoring the Regal Fritillary butterfly and it’s host plants to a native prairie. Same word. Drastically different meanings. The second factor, is the one that gave me so much anxiety in anticipation of the question during my candidacy exams. That is, what features of habitat are most limiting for a species of wildlife, and how do we know? Biologists are taught to remember Leibig’s Law of the Minimum. Without information on how limiting any one resource is, we’re left only guessing and often fail to see desired responses to habitat restoration that miss the mark on limiting factors. To uncover limiting factors we must take measurements, which presents its own challenges because wildlife are hard to observe (hence the ‘wild’ part). Volumes in my professional discipline are written on the issue of “imperfect detectability” and overcoming this observational challenge is the source of substantial frustration. Thus, to answer “what the heck is habitat” in Iowa, or any landscape, we need to make some assumptions. Leading to the chronically unsatisfying assertion — “it depends” — as the prevailing answer to the question. However, I think it safe to make a few generalizations to answer this question. To do so, I’m going to lean on the collective expert opinion of 74 of my peers that recently responded to a survey I sent to attendees of the annual Iowa Habitat Partners Conference (two of those attendees and conference organizers are featured on this month’s episode of The Conservation Chat). These 74 wildlife biologists from across the state were asked to rank “the ‘quality’ [of each practice] as habitat for pheasants, quail, and other farmland wildlife in Iowa.” I standardized each participant’s response so that each ranking ranged from 0, the lowest habitat quality score, to 100, the highest. Any changes to the status quo are improvements in habitat quality for farmland wildlife. 93% of respondents gave corn-bean rotations or continuously grazed pastures their lowest habitat quality score. Natural, perennial features like wetlands, prairies, and rotational pastures are higher quality. Diversity in plants and vegetation structure matter, as reflected by the negative attitude of the group towards ‘Non-diverse’ CRP fields and continuously grazed pastures. Beyond these generalizations, the wide range in respondent rankings clearly conveyed little consensus on the quality of individual features in the absence of additional clarifying details on the species or places in question. Here we find the final point of consensus. Immediately after I hit “send” on the survey, a chorus of cries of “it depends” and “this isn’t fair!” came echoing back to my inbox from every corner of the state. Biologists, trained to think critically about limiting factors, plant diversity, patch size and connectivity, and a whole suite of other factors determining the ‘quality’ of any given ‘habitat’, insisted on answers to questions like “What factors are already limiting”, “What species”, “What part of the state” and so on in their emails. I smiled receiving these emails because this skepticism, intuition, and critical thinking about what the heck is habitat is exactly as it should be. Today’s guest blog post is provided by Megan Koppenhafer, part of the Iowa AmeriCorps 4-H Outreach program, serving with Water Rocks! in 2017-2018. Lawn care consumes many families as the weather warms and things start to green up. This year as you foster your lawn we would like to encourage responsible lawn care to support our precious pollinators. Pollinators help keep our crops and gardens growing. You may have heard a lot of conversation about planting pollinator gardens to provide habitat and food for these little critters. These gardens are a great solution for protecting our pollinators, but a more holistic approach is even better. Lawn mowing frequency was explored in a study titled To mow or to mow less: Lawn mowing frequency affects bee abundance and diversity in suburban yards by Susannah B. Lerman, Alexandra R. Contosta, Joan Milam, and Christofer Bang. The researchers found that mowing the lawn less frequently, every two or three weeks as opposed to every week, provided more grass biomass and flower abundance for the bees in an herbicide free yard. Three weeks provide a more ideal diversity in bee species, while two week mowing regimens led to the highest overall abundance of bees. What does all this mean for the average lawn grower? Well, it shows that there is a low cost alternative for those lawn mowers looking to preserve bee habitat. Not applying herbicides or insecticides will benefit those bees by preserving the habitat and by directly removing a pollinator exterminator. Here’s your excuse to mow a little less often and enjoy the spontaneous lawn flowers a little more! Example of a typical yard from the Lerman, et al. study. The minimal landscaping and bare patches in the lawns were common. The yard sign explained project objectives and informed neighbors about their role in improving the sustainability of their neighborhoods. For more information please check out the full article, To mow or to mow less: Lawn mowing frequency affects bee abundance and diversity in suburban yards, by Lerman et. al. Also, check out this Proper Lawn Mowing guide by ISU Extension and Outreach to keep your yard looking green when you do go to mow it! In my first year in Iowa, I’ve found an engaged and motivated citizenry that values wildlife and their habitats. No wonder – Iowa has produced a disproportionate number of 20th century leaders in wildlife conservation, including William Hornaday, Jay “Ding” Darling, John Lacey, and Aldo Leopold. Proof of this commitment lies in Iowan’s support for each of our 99 locally funded County Conservation Boards, a model unique and perfectly suited for the state. Further proof lies in the outcome of a 2010 vote where 63% of Iowans voted in favor of a self-imposed tax and constitutional amendment to provide permanent funding for natural resource conservation and education. Additionally, a survey by the U.S. Fish and Wildlife Service estimates that 1.3 million people in Iowa participate in wildlife-associated recreation and spend $1.5 billion doing so annually. Wildlife and wildlife habitats matter to Iowans, our economy, and our land. Plenty of challenges remain. The meritorious work of public and non-governmental entities to preserve unique habitats in our state only amasses to about 3% of the land area. Between one and two million acres are annually enrolled in federal conservation practices that provide wildlife habitat. But even when combined with lands in public ownership, these conservation lands are only a drop in the bucket of Iowa’s 36 million acres. Thus, the challenge of preserving our rich wildlife heritage rides on the backs of the collective impact of small actions taken by all landowners in our state. Wildlife conservation challenges are driven by changes to natural ecosystems in our agricultural landscapes. This is where the opportunities lie, because just as wildlife populations track changes in natural ecosystems, so too do many other important ecosystem services. Wildlife are thus one additional beneficiary of sustainable land use practices and should therefore serve as one more bargaining chip in extolling the benefits and promise of conservation efforts that unite every sector and every resident in Iowa. We’ve all got a stake in this, and as we see improved soil health and water quality, we’ll see more pheasants and meadowlarks. That sounds like a win-win to me and I’m excited to learn how I can collaborate with the Iowa Learning Farms in the years to come. Dr. Adam Janke recently joined the ILF team in an advisory role, and will be a regular contributor to the ILF blog. Hear more of Janke’s perspectives on conservation and wildlife issues on the Conservation Chat podcast! Iowa Learning Farms is thrilled to announce the newest addition to its team, Dr. Adam Janke, joining the ILF team in an advisory role. As an Assistant Professor and Extension Wildlife Specialist with Iowa State University Extension and Outreach, Janke offers unique perspectives on conservation, wildlife, and working lands that will compliment the work ILF is doing across the state to build a culture of conservation. Growing up in a duck hunting family, his conservation ethic and passion for wildlife, especially waterfowl, certainly run deep. Janke has Midwestern roots as a native of Indiana, and his educational pursuits have taken him on a journey across much of America’s heartland, including stops at Purdue University (BS), Ohio State University (MS), and South Dakota State University (PhD). Having recently completed his first full year at Iowa State University, Janke is now the GO-TO GUY for all things wildlife in the state of Iowa, whether it be bats in the attic, chronic wasting disease in deer, or managing for habitat within our vast working lands across Iowa. You can get to know Adam Janke and his vision for wildlife habitat integrated within agricultural working lands through the Conservation Chat podcast. Tune in to Episode 29 of the Conservation Chat, just recently released, to hear Janke’s perspectives on wildlife habitat, conservation and more. When listening to the podcast, it’s pretty clear that Dr. Janke is super enthusiastic about what he does! And we are super enthusiastic about him joining the ILF team. Keep an eye out for his friendly face at upcoming field days, on our blog and E-newsletter, and we’ll also be working together on the Master Conservationist program (and more) in the coming months. I would agree. Wetlands play a key role of reducing nitrogen in Iowa’s Nutrient Reduction Strategy. Strategically designed and sited wetlands can reduce nitrate loads to downstream water bodies by 40-70%. Currently we have around 80 of the Conservation Reserve Enhancement Program (CREP) wetlands in the state. The NRS calls for 7,600 of them if we hope meet its goal. To read more about the importance of wetlands, check out Ann’s blog Wetlands and Water Quality. Beyond the water quality benefits and the job opportunities from siting 7,000 wetlands in our state, wetlands and the lands surrounding them will help bring needed pollinators and other biodiversity to our state. Finally, as Matt argues in his blog earlier this week about returning to pasturelands, wetlands add beauty to our landscape. If you don’t believe me, screen our award-winning documentary Incredible Wetlands. Keep your eye on our blog to hear more of what we learned from participants during the regional workshops. We hope to create a more positive learning experience through a Rapid Needs Assessment and Response (RNR) technique. To read more about our unique approach, check out Brandy’s blog RNR is a Favorite for Conservation Workshops. Over the past few weeks, the City of Cedar Rapids has received a great deal of positive press for their plans to convert 1,000 acres into prairie/pollinator habitat! Their new 1,000 Acre Pollinator Initiative will begin taking root this spring as acres and acres of diverse prairie are seeded throughout the city, in large part to restore habitat for native pollinators – birds, bees, and the iconic monarch butterfly. Where exactly do you fit 1,000 acres of perennial vegetation inside the City of Cedar Rapids? Anywhere and everywhere! They are starting this spring by seeding 188 acres of diverse prairie throughout the city. Numerous unused public land areas have been identified, including within community parks, select areas of golf courses, roadway medians, along trails, as well as in some less glamorous areas such as sewage ditches and water retention basins. Future plans in the five year project also include working with homeowners to voluntarily convert 10% of traditional mowed lawn areas to perennial vegetation for pollinator habitat. They are also partnerships happening beyond the city limits to include Linn Co. Conservation and the Eastern Iowa Airport (who is already on the forefront of numerous conservation practices – read more about the field day ILF held there last fall). It’s a truly fascinating project, and an excellent example of unique collaborations coming together to “make things happen” in the conservation world. Funding to date has come from the Iowa Department of Natural Resources-REAP Grant and the nonprofit Monarch Research Project. While the City is certainly a key partner in this work, the 1,000 Acres initiative has been fully funded outside of city and county budgets. Learn more about the 1,000 Acre Pollinator Initiative on the Cedar Rapids Pollinator and Natural Resources Initiatives page, as well as an article in Popular Science: A small city in Iowa is devoting 1,000 acres of land to America’s vanishing bees. 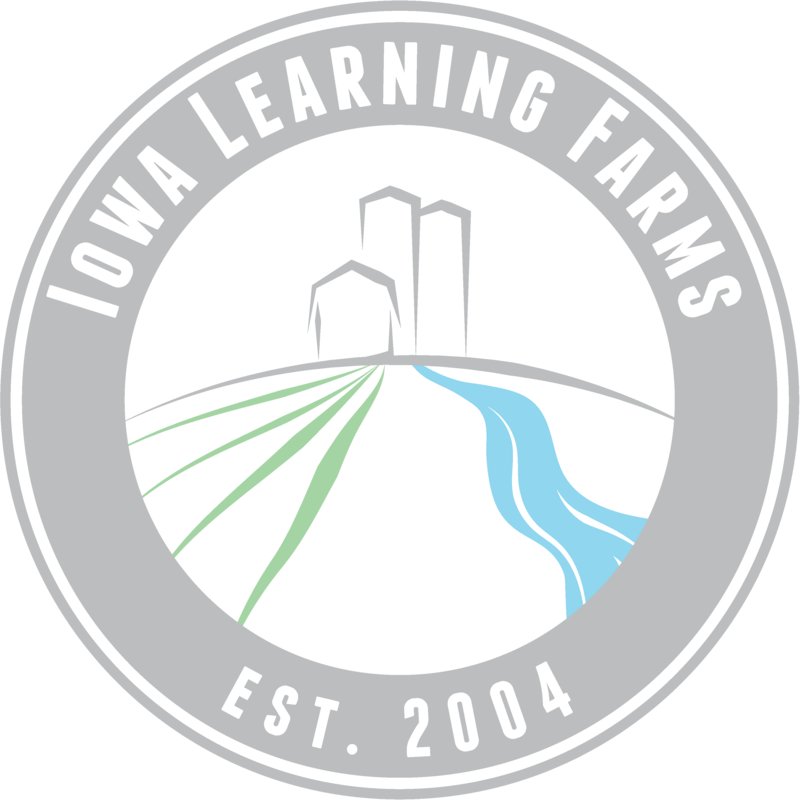 Did you miss the Iowa Learning Farms webinar this week? Steven Bradbury spoke about monarch migration, monarch status in Iowa and the nation, and the work that is being done in Iowa and beyond to maintain monarch habitat and to help monarch numbers climb. You may have heard about monarch decline. Bradbury emphasized that monarch decline is real. His graph shows a shocking decline of monarch butterflies in the last few years that is unprecedented. Monarch numbers can vary from year to year, and a big reason for that is because of monarch migration and the cyclical nature of that migration. It takes four to five generations of monarchs to make the journey north in the spring: one generation in Texas, Oklahoma, and Kansas; two or three generations in the summer in the upper Midwest; and then a final generation that migrates south to overwinter in Mexico. Each of those generations of monarchs can be affected by general stressors, weather events, and lack of habitat along their migration journey. Iowa fits into the conversation in a big way, as 50% of the migrating monarch generations breed in the Corn Belt. And, of all of the environmental stressors for monarchs, Bradbury ranks habitat loss as the largest reason for monarch population decline. In Iowa, much of our habitat loss is directly connected to our agricultural economy. Watch the archived webinar to see Steven Bradbury’s energized talk on monarch conservation in Iowa and beyond. There is much work already being done on this issue, but there is still more to do. If you are a farmer, landowner, or even a private citizen with a small amount of yard space, there are ways that you can get involved. There are ongoing projects that are studying monarch habitat as a compliment to other land uses, including within saturated buffers, over bioreactors, in underutilized grass areas, and near swine production sites. If you want to get involved or have questions on how to help, you can go to the Iowa Monarch Conservation Consortium or give them a call at 515-294-9980. To watch the webinar, check out our archived version here.